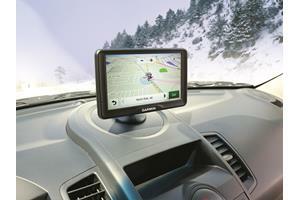 » What are the benefits of a navigation system? » Which is better: portable or in-dash? » How does it know where I am? » How do I tell it where I want to go? » How accurate are these systems? » What kind of directions do the voice prompts give me? » What is a traffic-information service? » Can I update my maps? » If I choose an in-dash navigation system, where should I mount my GPS antenna? Q: What are the benefits of a navigation system? A: In a word: fun. When you're using a navigation system to guide you around a new city, you won't worry about getting lost, which frees you up to enjoy your trip. You'll also be able to use your navigation system to find fun destinations, like restaurants, hotels, and tourist attractions, and useful destinations, like gas stations, banks, and even ATMs. You'll get plenty out of a navigation system when you use it in your hometown, too. Many will let you program multiple destinations, so you can save time when running errands by finding the most efficient routes between them. And many give you access to subscription traffic-information services that can warn you of accidents, construction, and more along your programmed routes, which is particularly ideal if you have a long daily commute. Q: Which is better: portable or in-dash? A: Really, the system you choose depends on how you're going to use it. There are distinct advantages to both. A portable navigator offers easy mounting options, no wiring or dash modifications, and the ability to transfer it easily from one vehicle to another. It comes with a mounting bracket (usually with a suction cup) that you secure to your dash, console, or windshield. You then only have to plug it into your vehicle's power port to get power. The GPS antenna is built into the device's housing, and maps are typically preloaded into the system's memory. The voice prompts the system uses to guide you are usually delivered over a built-in speaker. A portable navigator may be compact, but it usually offers impressive performance, and many offer extra features, including MP3 storage and playback. In-dash navigation systems are either part of or connected to an in-dash DVD player that acts as your vehicle's stereo and features touchscreen controls. When a navigation system is built into an in-dash DVD player, it's no more difficult to install than a standard in-dash stereo. In-dash systems offer significantly larger screens (an average of 7", compared to the typical 3.5" or 4" of a plug-and-play) for better map visibility. Voice prompts are delivered over your car's speakers. Many in-dash systems feature built-in hard drives that perform the navigation functions and store the system's maps. Others come with map DVD-ROM discs, and temporarily store relevant map and route information when you program a destination. 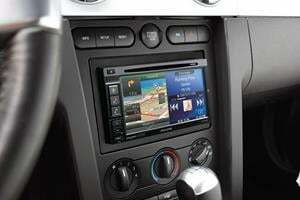 In either case, you can listen to your CDs or the radio while the navigation system is working. Q: How does it know where I am? 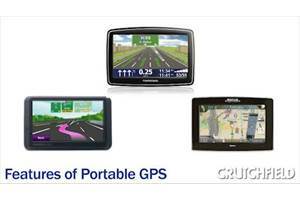 GPS (Global Positioning System): your navigation unit communicates with several GPS satellites simultaneously through a built-in or external antenna to determine your position. Comprehensive road maps and software: major roads, county roads, city streets, and important points of interest (including restaurants and hotels). Most portable navigators have the maps they use preloaded. Some in-dash navigation systems come with map DVD-ROM discs. The navigation system determines your position by comparing the information it receives from the GPS satellites to its road map information, then calculates the best route to your destination. Q: How do I tell it where I want to go? 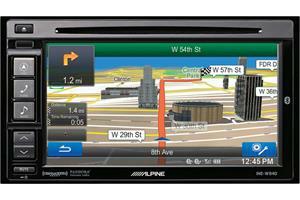 A: Navigation systems feature an on-screen interface that lets you enter your destination. Most often, you'll simply select the city you're driving to, then type in a specific street address. Many systems make this easier by using "predictive text" — offering suggestions after only a few letters, so you usually won't have to type in entire city and street names. You'll also have the option of selecting an intersection or choosing to go to the "city center" of a given town. Your destination options also include specific points of interest. You can choose a specific point before you leave, or find a point of interest whenever you get to your destination. Points of interest usually include restaurants, hotels, banks, gas stations, and even ATMs in some cases. Some navigation systems have the ability to respond to voice prompts — you literally tell them where you want to go. Q: How accurate are these systems? A: Navigation systems are very accurate. The navigation device constantly recalculates your position, and accuracy is usually within 15 feet. Processors for both the GPS receiver and for the antenna help the system keep locked onto the satellite signal, and translate the information quickly to keep track of your position as you're driving. Q: What kind of directions do the voice prompts give me? A: The voice output provides information on how far you must travel until your next route change, and gives spoken driving instructions — these commands simply mirror the route indicators on your navigation screen. Text-to-speech systems will say the street names out loud, for greater accuracy. Most systems allow you to navigate with or without voice output. Q: What is a traffic information service? A: Some systems, including various portable and in-dash navigation systems, let you subscribe to a traffic-information service. These services can warn you of traffic incidents that occur along your programmed routes, including accidents, construction, planned traffic diversions, sporting events, and more. If incidents occur, you'll usually have plenty of time to adjust your route. Some services, in certain areas, will even monitor and inform you of the average rate of traffic flow along the roads you'll be taking. Traffic-information services are currently available in select metropolitan areas only (although the number of coverage areas increases periodically). Several different services are available; the one you subscribe to depends on the model of navigation system you own. Q: Can I update my maps? A: Most systems, portable or in-dash, allow you to update the maps on your system, either by loading new ones into the built-in memory, or by purchasing updated map discs, depending on the format your navigation device uses. Map updates are released periodically and reflect the latest map information available to reflect road changes and new construction. You shouldn't have to update your maps too often, however. The prices for map updates depend on the manufacturer of your system, and can range widely, especially with in-dash navigation units. Some systems allow you to purchase and upload maps from different parts of the world, too, such as Europe. If your travel plans include intercontinental travel, you might consider a portable navigator that gives you access to map options beyond North America. Q: If I choose an in-dash navigation system, where should I mount my GPS antenna? Don't place the antenna on your rear deck if you have a finely wired rear defogger. If you plan on placing it inside the vehicle, remember that metallic window tint can interfere with reception. Windshield-mounted radio antennas and solar-reflective windshield can also interfere with signal reception. Place the GPS antenna at least 5 inches from any other communications antenna or a physical obstruction like an "A" pillar.